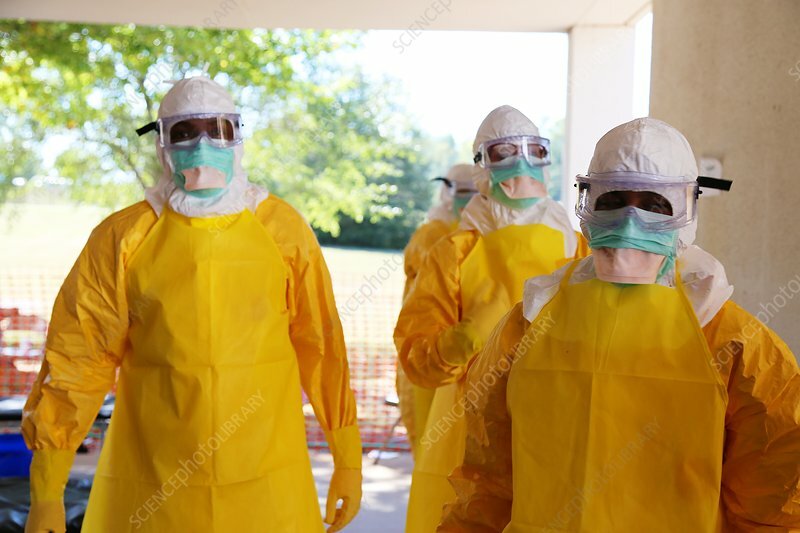 Medical personnel being trained in the proper protocols for ebola virus prevention. This personal protective equipment is worn by those that have direct contact with infected individuals. Ebola virus disease (EVD) is a severe and often fatal disease with symptoms including fever, fatigue, muscle aches, vomiting, diarrhoea and haemorrhaging (internal bleeding). It is spread through direct contact with infected bodily fluids. There is no cure for the disease, but three quarters of patients can recover if provided with sufficient medical support. The 2014 outbreak in Western Africa is the largest ever recorded and has been declared an international public health emergency. As of 19th October 2014, 9935 cases had been reported, with 4877 fatalities. Photographed at the Center for Domestic Preparedness, Anniston, Alabama, USA.